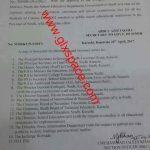 Government of the Sindh, Department of Education & Literacy, Director General (Colleges) Sindh has issued Notification No. 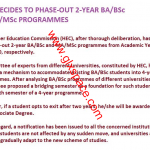 DGCS/P.S/2014 dated 15th September 2014 in connection with Online Courses of Bachelor and Master Degree from UK Universities. The Education & Literacy Department Government of Sindh has planned to provide facility of online courses of Bachelor Degree in the field of Information Technology, Commerce, Business Administration and Accountancy etc from accredited Universities in UK through distant learning programme with courses are expected to begin July 2015. In this connection, the students can obtain said degrees via online learning/teaching from British Universities against the payment of 5000/- Pounds (Approximately Rs. 850,000/-) for a three years complete course which is a fraction of the amount charged by the aforesaid Universities in UK (UK fees are a minimum of 27000/- Pounds) plus three years living and residence expenses, travel etc, total cost estimated upto Rs. 16 million PKR. After the completion of the course the students will be awarded a degree from leading/accredited Universities of UK recognized by Higher Education Commission, same as awarded to the students studying in UK. The senior minister of Education & Literacy Department Sindh has desired that the students of intermediate classes studying in Government Colleges of the province be facilitated this opportunity. 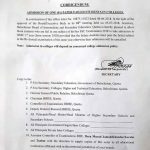 It is directed to circulate this letter among the principals of the Government Colleges of the respective region and furnish the names/list of students who have interest in obtaining admission in the above said Universities of UK. It will be highly appreciated if potential students afford the expenses mentioned above, although there will be an endowment fund to assist some students. By adding their names to the list, students will not be made any commitment, not will they be guaranteed a place but they will obtain priority over those registering later. 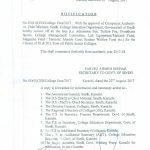 The principals who will also act as focal person in their respective colleges are hereby directed to furnish the list of all prospective students interested in the above said courses not later on 14th October 2014. Special Thanks to Mr. Salim Kehar by sending the copy of the Notification. 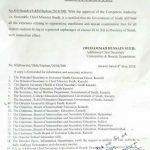 I was given higher time scale promotion from BPS-16 TO BPS -17 on 15.09.15 w.e.f 10.09.14. I was drawing basic pay Rs.21200 on 10.09.2014. My pay was adjusted to next stage at Rs.22000 which was also 5th stage of BPS-17.I opted for increment of BPS-16 along with notifications of Finance Division of Govt. of Pakistan, as more than 6 months served in BPS-16.but option was not accepted by the authorities. 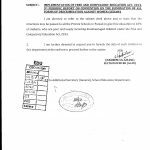 In such a way, From 2.12.14 to 30.06.15 there was no difference in basic pay of BPS-16 and 17. My pay was fixed at 28455 according to Rs.22000 w.e.f 01.07.2015.
whereas 30th stage of BPS -12 is also Rs.22000 revised as Rs.28555.There is a difference of Rs.100.